Circus Tent - הירשל ציג'ס בלאג: "Asking for a Friend"
interesting note, here you degrade the 'perverseing' (i guess) of the Sfas emes and the sifrei Reb tzudig by opportunists.., in the next post you elate the chovas ha'talmidim.. and this all from a lubab.. .
His brother used to go to farbrengens and has a likutei torah in his house. He is now an associate mashgiach in BMG. IDK about him. His quoting the Yated is priceless. u: "not just a sterlized piece of -- Reb Tzadok,"
sterilized and crystallized perhaps, but not very homogenized or internalized. NOT FOR HARRIES & LARRIES. 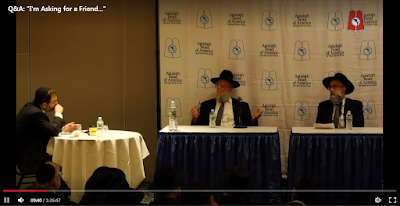 "open a chassidishe sefer - not just a sterlized piece of"
"Maybe one day Rabbi Brudny will cross the "dreaded" line and open a chassidishe sefer - not just a sterlized piece of Sfas Emes or Reb Tzadok, but like heavy chassidus." What is "heavy chassidus"? Like heavy water? Only Lubavitch? What about Lubavitch lite like Reb Simon and Reb YY Jacobson? "Maybe one day Rabbi Brudny will cross the "dreaded" line and open a chassidishe sefer - not just a sterlized piece of Sfas Emes or Reb Tzadok, but like heavy chassidus. I think he's ripe for it. I think he really wants to but he needs a helping and guiding hand. His transformation these last few years has been quite remarkable; going from a rigid איש גבורה to a much kinder, gentler person who understands the difficulties that face Jewish youth today." Ah, you want him to convert, become a Hasid, maybe even a Lubavitcher, huh? The first Lubavitcher on the Moetzes? But aren't Lubavitchers not part of Agudah? And others can keep on dreaming that you will see their light. Maybe one day you will get to know the טיפע ליטוויש וועג, and move beyond your superficial stereotypes of Litvaks. R. Elya shlit"a learned in di yugent yoren in a Chasidishe Yeshiveh - Teyreh Vodaas in Williamsburg. Long time listener, first time caller. Okay, not 1st time but been a long time since I commented. Just a quick fix on a mistake your are making here. R' Brudny has NOT changed. He was always progressive as is his brother, as was his father. Rabbi Elefant is another story for another time. "Rabbi Elefant is another story for another time."